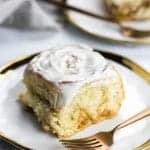 This Apple Pie Cinnamon Rolls recipe topped with delicious cream cheese icing is a great combination of our favorite indulgences; Apple Pie and Cinnamon Rolls. When you combine these flavors you will have everybody’s favorite treat during this holiday season. How often do you make homemade cinnamon rolls for breakfast? If you say “not often because they are too complicated”, hold that thought! I can give you a great recipe for Apple Pie Cinnamon Rolls with luscious icing which is quite easy to make. I didn’t say it is quick, because it still takes some time to prove the dough, but the steps are very easy to follow even if you are not a professional baker. There are different ways on how to make cinnamon rolls from scratch. The easiest way is to use a stand mixer, because you can just put all the ingredients in at once, and this magical mixer will do all the mixing and kneading work for you. BTW, if you decide to exclude apples from the recipe (which I strongly advise against), you still will have delicious classic cinnamon buns. When you make the dough you can make it by hand and just knead the dough or use a stand mixer with dough hook attachment (I think the second technique is much easier). 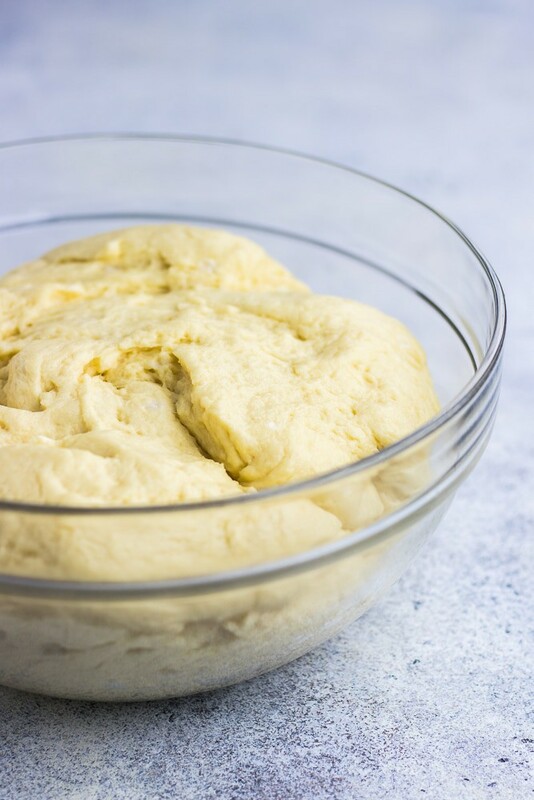 If you decide to use a stand mixer, you just need to mix all the ingredients together and knead it in the mixer for about 5 minutes until the dough is smooth and elastic. When done, put the dough in a greased bowl, turn it around so the oil covers all the sides, cover with plastic wrap or a clean kitchen towel and put the bowl in a warm place to rise for about 2 hours. While the dough is rising, let’s look at apple pie filling recipe. You will need to preheat a skillet over medium/high heat, add unsalted butter, diced apples, zest from one orange, and apple cider and bring it to boil. Then turn the heat down to medium/low, cover with a lid and simmer until the apples are soft. Drain the mixture through a fine sieve and set aside to cool off. Before you add the apples to the cinnamon rolls, add a tablespoon of all-purpose flour and mix well. That will help to absorb the excess liquid. When the dough is ready, roll it on the floured surface, spread over softened butter, sprinkle sugar and cinnamon mixture and precooked apples which have been previously drained from the liquid and mixed with flour. Roll, cut into 12 even pieces, put them into greased pan, cover and set them aside at warm place for another 30-40 minutes. Bake them at 350°F for about 35 min or until golden/brown color. Top with cream cheese glaze and enjoy! 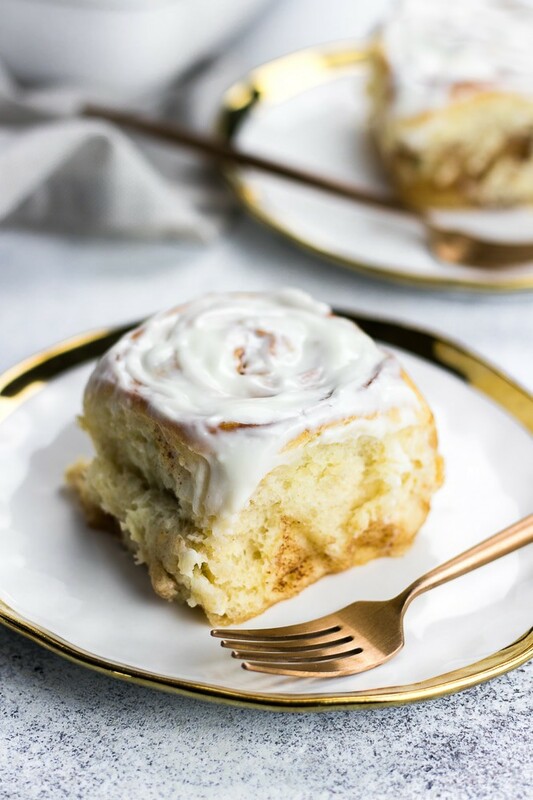 This Apple Pie Cinnamon Rolls recipe topped with delicious cream cheese frosting is a great combination of our favorite indulgences; Apple Pie and Cinnamon Rolls. When you combine these flavors you will have everybody’s favorite treat during this holiday season. In a small bowl, combine together warm water and 1 teaspoon of granulated sugar. Sprinkle 1 package of the yeast over the top and set aside for about 5 minutes. In the mixing bowl of a stand mixer (with a dough hook attached), add all-purpose flour, salt, granulated sugar, melted unsalted butter, an egg, whole milk, vanilla extract, and yeast mixture. Mix it on a low speed until combined, then switch to a medium speed and knead for about 5 minutes until the dough is smooth. Grease a large bowl with a tablespoon of vegetable oil. Place the dough in the greased bowl, turn it around so the oil covers all the sides, cover with plastic wrap and place it in a warm place to rise for 2 hours. While the dough is rising, make the filling. In a preheated large skillet on a medium/high heat. Add a tablespoon of butter, diced apples and orange zest. Mix it and add apple cider. Bring it to boil, then reduce the heat to medium/low, cover with a lid and simmer for 10 minutes until the apples are soft. When done, drain them through a fine sieve and put soften apples aside to cool off. When the dough has risen and doubled in size, roll it out on a floured surface into a rectangle. Spread over 4 tablespoons of softened butter and sprinkle over the cinnamon/sugar mixture evenly. Mix apple mixture with a tablespoon of all-purpose flour and spread it evenly over the cinnamon/sugar. Roll into a log lengthwise, starting from one end to the other. Using a sharp knife, cut it into 12 even slices and put them side down in a buttered 9×13 baking pan. Cover with plastic wrap and put it in a warm place to rise for 30-40 minutes. Preheat the oven to 350°F. 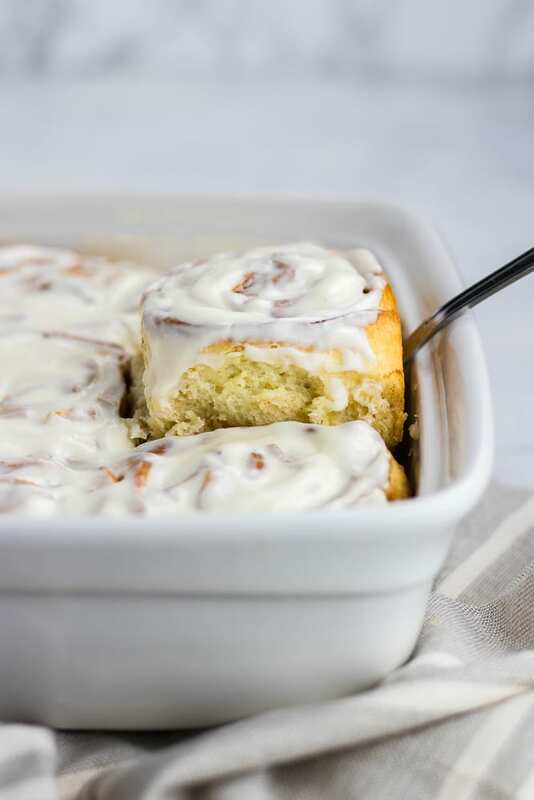 When the cinnamon rolls has risen, brush them with 1 tablespoon of melted butter and bake for 35 minutes or until golden brown and baked inside. While they are baking, mix cream cheese, butter, powdered sugar, vanilla extract in a mixing bowl, and using a fork, mix it together until well combined. Add some milk until you get a slightly runny glaze consistency. 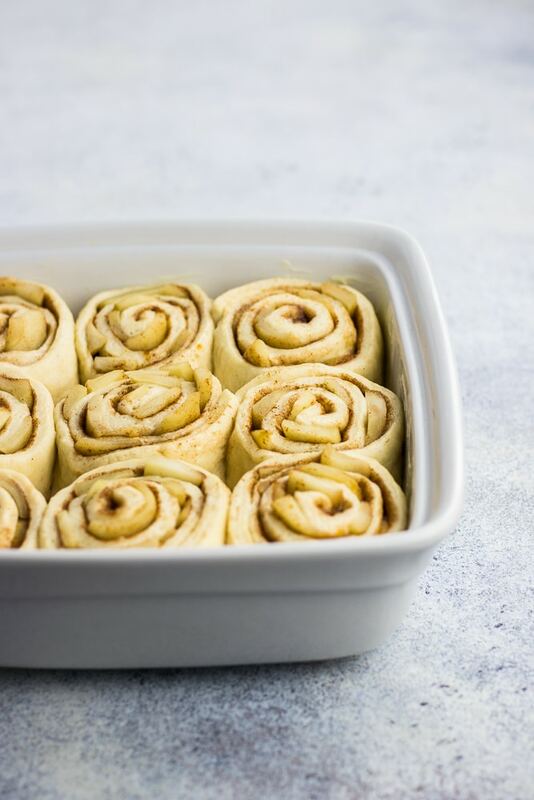 When the Apple Pie Cinnamon Rolls are baked, spread the glaze over and enjoy! 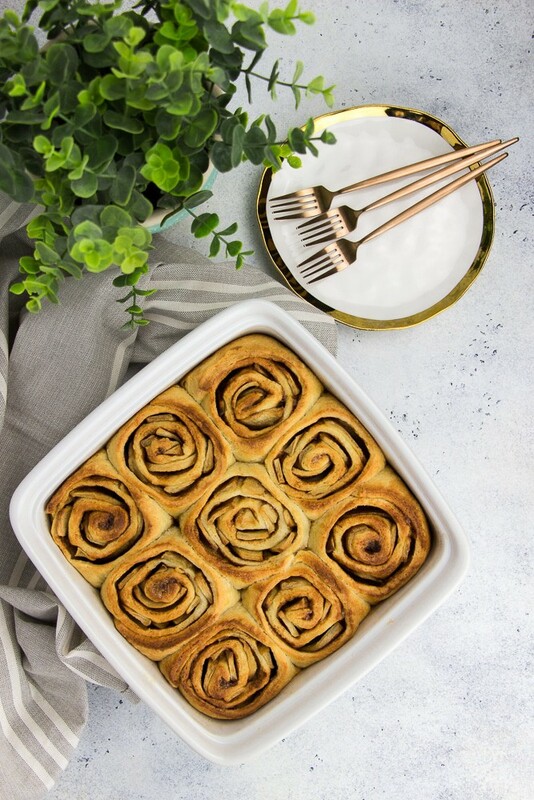 We always do cinnamon rolls for special occasion breakfasts (birthdays, holidays, etc…) and I’m always looking for new ways to do them! We have two upcoming autumn birthdays, and nothing says autumn like apple pie! Totally making this!